Impress your friends by always knowing about the cool and unusual things going on in London — sign up to our Londonist Daily email to get our articles sent straight to your inbox at 5pm. That’s everything from ticket alerts to restaurant reviews, London news and insightful features. You can subscribe to all of our newsletters (or pick and choose which ones you receive) here. Lunch hours are precious. We all know that. Last year, we got so frustrated by the intricacies, queues and endless decisions to be made on a lunch break that we ended up trying to resolve the unsolved mysteries of the London lunch break. 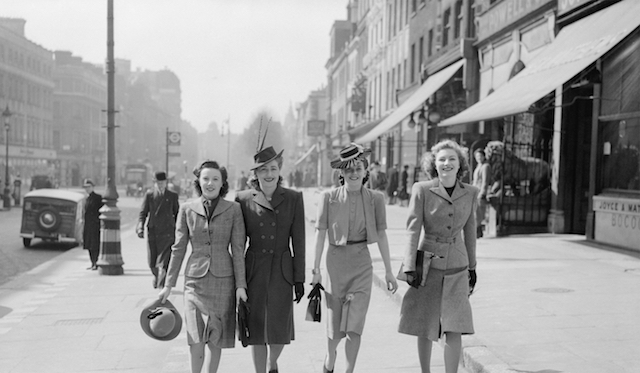 Fashion on the Ration opens at Imperial War Museum. BREAKFAST TOUR: Head to Museum of Childhood in Bethnal Green for an exclusive view and guided tour of the exhibition Small Stories: At Home in a Dolls' House. £15, prebook, 9am. For info on other behind the scenes tours, click here. HAMPTON COURT TOUR: As Hampton Court Palace marks its 500th anniversary, take a guided tour of Henry VIII's Baroque palace and gardens. £12/£6 (doesn't include entry to Hampton Court Palace), prebook, 2.30pm. See also our behind the scenes video revealing the secrets of Hampton Court. Book ahead for tickets to Comedy for Depression, a comedy benefit evening taking place on 23 April (during Depression Awareness Week) at Union Chapel in Islington.